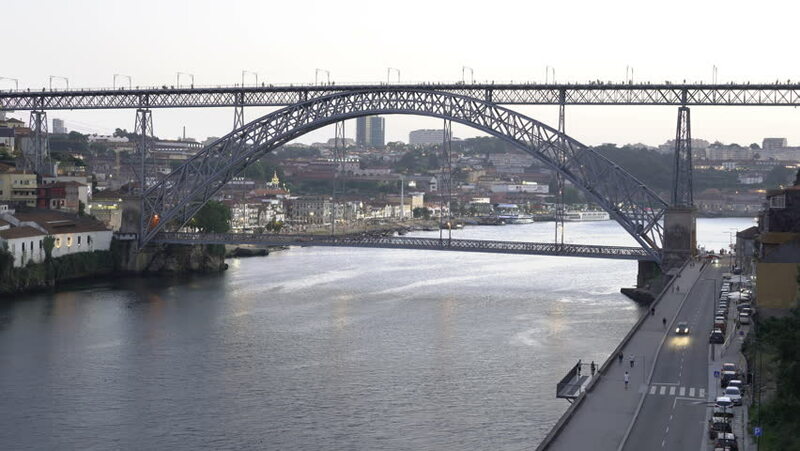 Porto, Portugal Dom Luis I bridge view over Douro river 4K evening to night time lapse. Vila Nova de Gaia area with illuminated traditional buildings visible at background. 4k00:12Concept youth lifestyle subculture. Crazy risky selfie of a group of youth on top of the bridge. Life-threatening. hd00:32BRATISLAVA - JUNE 6: Danube at high flood by highest measured water under SNP bridge on 6 June, 2013 in Bratislava, Slovakia. 4k00:16July, 2017 - Porto, Portugal. Ponte de Luis in Porto, Portugal old town skyline from across the Douro River.